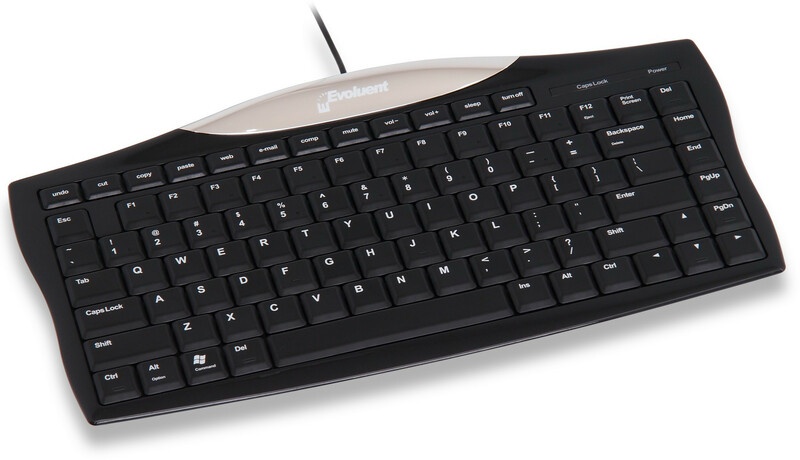 The Evoluent Compact Wired Keyboard removes the number pad for a shorter reach to the mouse during the work day. The reduced reach to the mouse can bring relief to shoulder / rotator cuff discomforts during the work day. The back edge is not tilted up so the entire keyboard is fully flat to eliminate the need to strain your hands upward. The key tops are only 1 cm or 0.4″ off the top of the desk to further reduce wrist strain. All the hotkeys work without a driver in Windows XP or newer. The hotkeys do not work with Mac OS but all other keys work and Mac functions are printed on some keys. ▪ Compatible including hotkeys. No driver necessary. ▪ Compatible except hotkeys. No driver necessary.